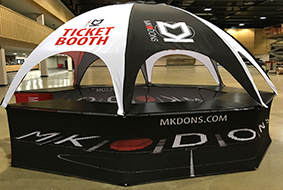 Found by a Google search, Areca Design was selected by MK Dons to provide an innovative solution to their ticket-sales problem ­an outdoor pop-up ticketing booth. The pop-up ticketing booth has been used in a variety of locations, from outdoor events and festivals, to conferences, matches and indoor shopping centres. A very flexible, easy to use and eye-catching unit.